Keep your site and customers safe from hackers and online threats. Site Protection identifies malware and security holes on your site that could allow a hacker to steal information, vandalise your site, infect your customers or be blacklisted with Google. Site scanner daily vulnerability scan will find these threats and quickly fix to protect your online reputation. Site Scanner will automatically scan daily and check for malware threats using remote scans and server scans. Daily scans of your entire site to detect any vulnerabilities, and prevent attacks and infections before they happen. Site Scanner checks for risks, and validates them to ensure they are real threats. This early warning system helps you steer clear of search engine blacklisting. The vulnerability scanner does penetration testing to find any holes to help prevent from SQL Injections to your database that can seriously harm your business. Anything harmful to your site will be cleaned by professional analyst who will identify anomalies and clean fast as required. Site Scanner looks for malware links on your site and crawls the website for security holes that hackers could use to access your website or steal customer information and infect your site visitors with spyware and viruses. Google will "blacklist" your site if deemed as "suspicious". Site Scanner will always alert you of vulnerabilities before this can happen and checks Google Safe Browsing daily to make sure your website isn't on the "blacklist". Site Scanner can be set up within seconds and requires no software to manage. Daily scans will check for thousands of web-based vulnerabilities, and send you alerts if triggered by email or Twitter with information so you can make quick decisions. Monitor your site and results and improve your site's security with our online dashboard. Quickly identify any issues and get a detailed report on what they are, where they are, their threat level and suggestions on how to fix and cleanup. Our online security experts are there for you and your business 24 hours a day, seven days a week. Bottom line - we've got your back. Every day of the year. Input fields in your website are a hacker's dream. 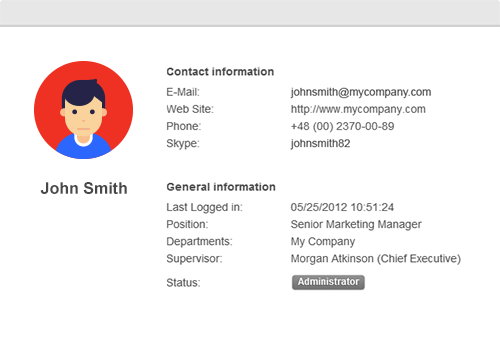 This is where customers enter information into a form such as login and password or their name, address, email, phone and any other form of data. This input can open doors for hackers to access your website database exposing all your customers information. When fields aren't properly checked, hackers can insert code that exposes everything in your database. This is a popular exploit for identity theft. Don't be blacklisted by Google®! Site Scanner scans and checks your website daily to ensure that your website is NOT being used to spread malicious software. If your site is deemed "suspicious" by Google, they will "blacklist" it from their search engine - affecting your site traffic, sales, business's reputation and SEO positions. 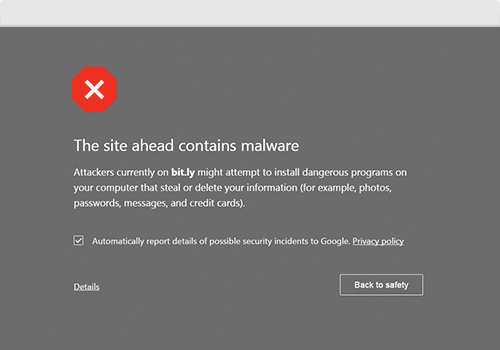 Site Scanner will always alert you of vulnerabilities before this can happen and checks Google Safe Browsing daily to make sure your website isn't on the "blacklist". Avoid infecting your customers’ computers! Links on your website are popular access points for hackers. Any link your customers use to download product information can be intercepted by hackers who can inject malicious code that redirects customers to another site, and could deploy spyware or malware to their computers. Site Scanner will daily scan destination URLs on the server side to avoid this hack. This is a favourite hack by all hackers: straight out, in your face, website vandalism. It can happen at any time, sending a clear message that your site is not secure. Hackers can do this by injecting code into input fields, so that when your visitors submit comments or forms, derogatory messages may appear. Does Site Scanner monitor my DNS? Yes... Site Scanner will monitor the IP address and associated DNS information of your domain for any changes. It's rare for it to change, but if it does we will alert you. Does Site Scanner monitor my Domain Name? Yes... Site Scanner will monitor the WhoIs for your domain name. The WhoIs is an global internet directory that provides information on who owns a domain. This record contains information about the Registrant (the person who owns the domain), the Registrar (the entity that registered the domain), the dates, nameservers and other similar, and important, information. If at any time this information is changed you will be instantly alerted. What type of malware does it scan? 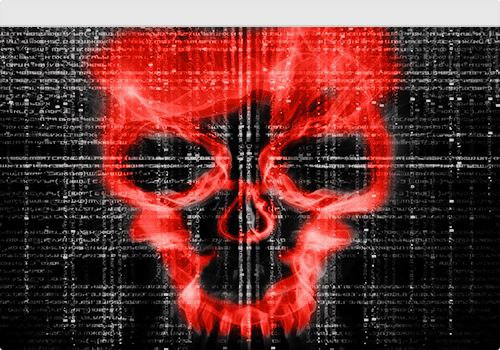 Site Scanner identifies malware, SPAM injections, website errors, disabled sites, database connection issues and code anomalies that require special attention. Does Site Scanner offer server side scanning? The server-side scanner is dependent on server-level access and has the ability to crawl every file on your server. This makes it ideal for things that don't present themselves on a client's browser, like Backdoors and Phishing files. Please note: Site Scanners server side scanning service is NOT compatible with our Website Builder product due to the infrastructure of the Website Builder Product’s back end. What is included in the removal and cleanup? When you are alerted to an infection, you can login to your Account Manager and request a clean. This clean request will alert our team to work with you to remove infections from your site and the process will continue until all malicious code is removed. Can my defaced site be fixed? 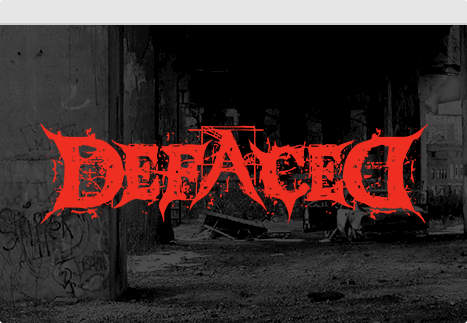 If your site has been defaced, our service will remove all affected files. The original files will need to be uploaded again to your site. Crazy Domains does maintain its own backup files for hosted customers and a recovery backup fee will apply. Please note, whilst we maintain a backup system we cannot guarantee restoration and it is advised that you maintain your own backups.